“It’s not just a business; we actually care about your well being.” Dr. J Peruvingal DPT. 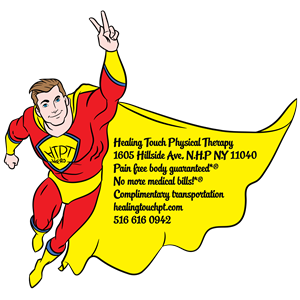 Why is Healing Touch Physical Therapy “outrageously” successful? I never had a lemonade stand or paper route, and never been a business man. Walking home from Martin Van Buren high school in Queens village, N.Y. Whenever I see a mature person mowing the grass or shoveling snow I would say “take a break, I got it”. I never took any money from them until it was forced upon me. Very few people took advantage of my good nature but majority didn’t. Word got around the neighborhood fast that I was the go to kid for anything that needs to be done around the house. Years later when I graduated from P.T school and started to look for a job-goal of every employer was to keep the patient as long as they can so maximum money can be milked from insurance companies! Of course I vowed against that so I had to open my own practice at age 25 instead of going to clubs. The only marketing I had was word of mouth and it is still remaining as the central part after 17 years! Thank you for choosing us, the following sets us apart. We provide training for local therapists in highly skilled manual therapy. ​Inventor’s of traction and extension table for low back pain. (U.S. Patent 7,648,473). We have received Certificate of Excellence from American Red Cross. We accept most insurance companies. If we take you in as a patient, you won’t see a bill from us unless your insurance got terminated. We provide complementary transportation to all our non-emergency, ambulatory patients that have difficulty getting here. Our wellness program is only $10 per month with no initiation, termination or contract. Join a wellness program to prevent most noncommunicable diseases such as obesity, diabetes, high and low blood pressure, heart attack, and stroke. Helps to reduce stress, improve energy and increase bone density. Join as a group for social interaction. Free one on one session with a brain tumor survivor regarding the importance of having a positive outlook. If we can help you, you will know it within two visits. "Experience the healing touch from caring hands". "Before receiving therapy here, I was experiencing a lot of pain on my neck and upper back. From day one, I was given the confidence and help I needed, and it really made a difference. I did receive the healing touch from caring hands! After several sessions, my pain is much less and limited to a small area. The therapists here are very caring, knowledgeable and skilled. With some improvements to the rooms and physical set up, Healing Touch may become a center of excellence in Physical Therapy." Tresa Mary in New Hyde Park, NY.